Some people reject the idea of swim with dolphins because they don’t have enough information about it, and it is common to be afraid or not see the benefits of live an experience like this one. Today, we are going to tell you all you have to know about swimming with dolphins. We know now, thanks to our experience, all the possible questions that you may have about the dolphins in Cancun, how are the habitats or where are the places to swim with dolphins, and because we want you to informed very well about this, we will try to resolve all your doubts. Not at all, they are very friendly and curious about human beings and, if treated gently, have been known to develop strong bonds of love and respect with humans. As any other animal, you have to respect them in very moment, if you do this, we can ensure you, you are going to live an experience like no other. We provide each visitor with a life vest to be used during the program activities, so don't worry if you don't know how to swim. Our staff is trained to make sure you feel safe, comfortable and ready to enjoy your experience with the dolphins in Cancun. This experience is available for everyone, no matter age, condition, gender or race. The only thing you have to consider, is that at the moment of your reservation it is important to mention special requirements in case of handicapped or disable visitors. In the case of children, if they are under the age of 8 or shorter than 1 meter (3.3 ft) must to be accompanied by an adult during the interaction and every moment while they are in any place to swim with dolphins. No matter what kind of interaction you decide to have, always will be an Animal Care Specialist with you, explaining to you and the other visitors all you have to know about the interaction, the dolphins behavior, their nature, feeding habits and the most important, the way you have to behave while youre swimming with dolphins in Cancun. Is any item necessary to swim with dolphins? All you have to wear is a swimming suit, in the women’s case we suggest to choose a one piece swimming suit to feel more comfortable at the moment of doing some activities during the interaction. any other clothes that it is not your swimming suit. Now that you know more about the interactions, do you feel ready to book some vacations and swim with dolphins in Cancun? This is an activity you have to live at least once in a lifetime. 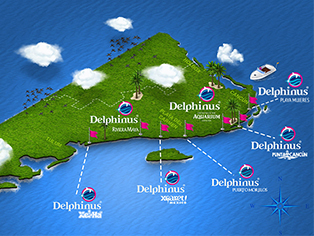 Know the natural habitats where you can do it and choose the perfect place to swim with dolphins in Cancun.